Pouch laminating machines use a laminating pouch that is composed of two plastic sheets (PET-Polyester) sealed (hinged) on one side. On the inside of the laminate pouch is a coating of heat activated adhesive. Your document is then interested into the pouch and into the machine. Some laminators require you to first put the pouch into a file folder like item known as a "carrier" prior to inserting it into the laminator. 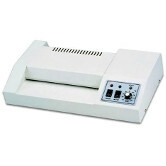 Pouch laminators are available in different widths from ID card size to full 11" x 17" sheet size. Heat mechanisms vary from heat plates to heated roller types. 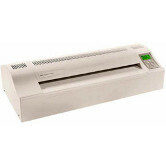 Heated roller laminators provide heat and pressure at the same time and are referred to as "photo laminators"
The ML-6 is a commercial duty, carrier free 6-¼" pouch laminator. 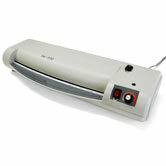 It provides easy and professional laminating of documents up to 6" wide. The ML-9 is a commercial duty, carrier free pouch laminating machine allows production laminating of up to legal size thermal laminating pouches at an economical price. 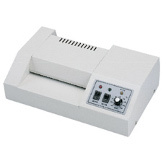 The ML-13 Commercial duty, carrier free pouch laminator allows production laminating up to menu size at an economical price. The Ultra Photo 13 Photo Pouch laminates up to 10mil thick and 13" wide It is rated as industrial duty and has 6 rollers (4 heated) driven by durable metal gears. 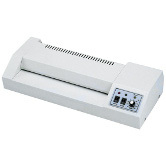 The GBC H700 Heat Seal 18" Pouch Laminator features a 18" throat for documents up to poster size. 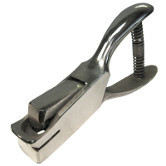 Heated roller design provides exceptional quality on photos and other glossy stock. 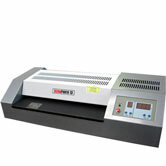 The Speedy-Lam 330R-10 10 Roller Pouch Laminator is the fastest pouch laminator on the market. 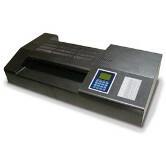 Clocking in at 12 feet (144") a minute, it can laminate up to 15 letter size sheets a minute!